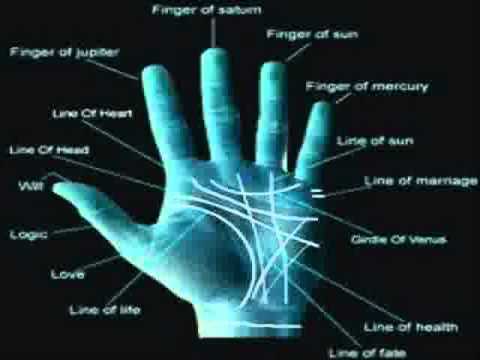 The Simian Line is a fusion of the Heart and Head lines and crosses straight across the palm. This presages a dedication to violent conflict of emotions. Which shall rule? Heart or Head? The Line of Saturn is often times referred to as the Destiny Line. If clear, well-defined and free of islands or other blemishes,it shows how and when life’s aims will be achieved. It is a line much associated with both blue- and white-collar work. The Line of Apollo is a fairly rare vertical line starting below the mount of Mercury .It is associated with financial,creative and personal success,which will be widely acknowledged. An honor may be involved. The Line of Neptune is another rare line,but when it appears it is powerful indicator of important weaknesses. Also known as the via Lascivia, it is rarely other than faint as it breaks away from the Life Line ( of which it can appear a part ). and moves towards the lower Mount and stronger narcotic substances. The Rascettes of Venus are the line , usually three which appear around the wrist, each one representing 30 years of good health. Broken or weak lines have other health implications. The Lines of Influence run parallel to vertical line such as life , Saturn and Apollo. They strengthen the influence and act as a link if there is a break in the main line. They can also rise on the Mount of the Venus and move across the palm. As they cross the other lines they presage trouble .Combined with a dot ,island or star ,they are warning signs. Lines are modified by the various marking which appear on them or alongside them. Breaks appear to give an obvious message ,but splinting or splintering mark an even greater influence,not always for the bad. They may indicate a new , positive phase. Island appear as small loops in a line, weakening its strength and dissipating the potential energy generated by the line. Several Island together form a chain leading to a period of serious indecision and wasted emotional and physical resources. When a fork or split , appears at the end of a line it invariably reveals balance, though in conjunction with other signs it can suggest indecision. A dot is a slight , colored mark on the line and always suggests a setback, in relationships or health. A square, often superimposed on a line, intensifies what should be happening at that point in the line. The hand can provide excellent career guidance, unveiling hidden talents and suggesting new area to explore . As with astrological predictions, it wold be ridiculous to suggest that everyone with a square hand is going to be a son of toil or every conic hand a concert pianist,but with creative thinking a good reading could channel the talents of such into unexpected activities. Square Hands do indeed have a particle bent and are hard workers. They are creative in outdoor pursuits, such as gardening and indoor pursuits, such as computer programming or office management, where their organization makes them stick at dull repetitive jobs, when they could achieve so much more. Spatulate Hands are those of movers and shakers. They get things done,constantly trying to use up a seemingly unstoppable flow of energy. Good organizers, they lean towards leader ship and are prepared to take risks. They are often possessed by inventors. either theoretical or practical. This hand is most often masculine and can be associated with sports and sports therapies. Conical Hands are creative hands pouring out ideas or taking them in with equal alacrity. Unusually for such busy brains, they can work as part of a team,but their input might at times be almost overwhelming. They are found often in the arts- acting ,singing, dancing or designing and when tending to an ample consistency, can be creative in field such as cooking. Psychic Hands are those of dreamers and visionaries. Who can apply their skills in the fields of counseling,psychology or other areas of interpersonal communication . It is also likely that they will veer towards artistic pursuits such as literature, the fine arts or the beauty business.